I thought I could live with the mint green color on the cupboard awhile longer. But I was wrong. My chair where I work looks directly at the dining space. So I had to look at that mint green with the olive green curtains in the background. I’m much happier with this light shade of blue. And it also goes with these polka-dotted and gingham dishes I’ve had for years. So while I had a quart of the blue paint, I also painted a few more pieces of furniture. 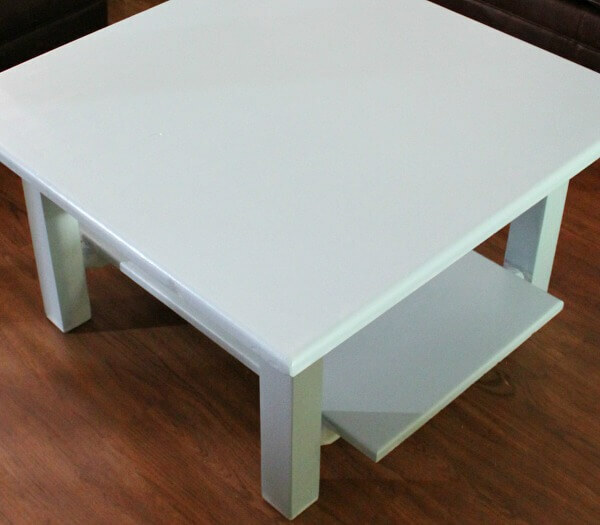 I originally painted the coffee table with chalk paint. Unlike most everyone else, I was not pleased with it. 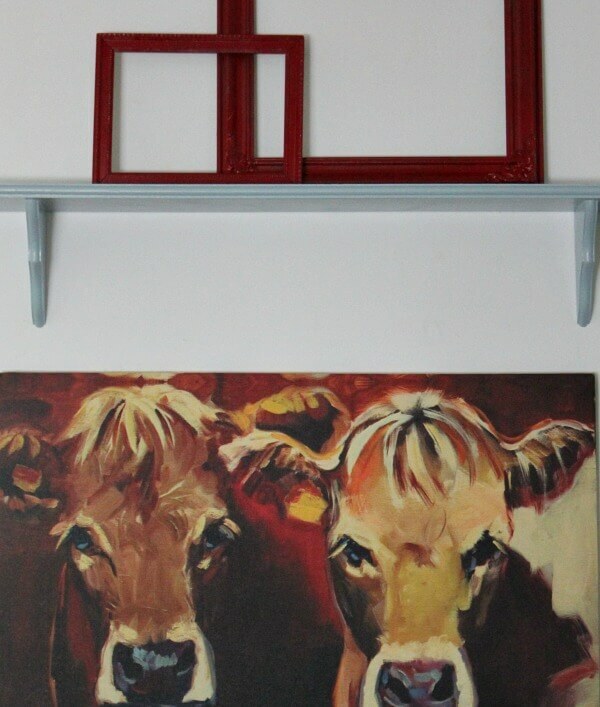 And I painted this shelf. Tomorrow I can place things on the surface of the coffee table. I can then start my fall decorating. 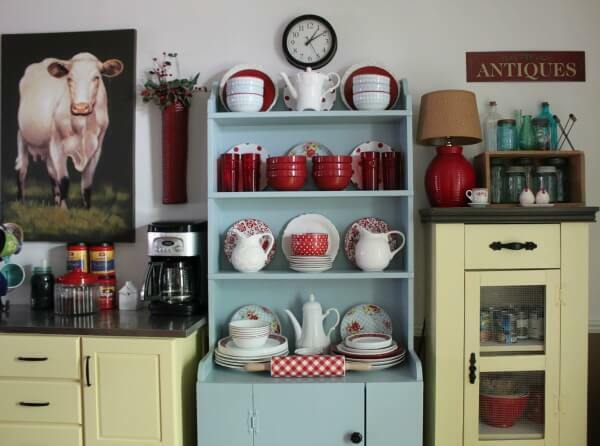 Do you like the blue, or did you like the mint green color best on the cupboard? Have you begun to decorate for fall yet? I loved the mint green but now that I see the blue — I like it better. It is so beautiful with your dishes. I totally understand not liking the green with the olive curtains. 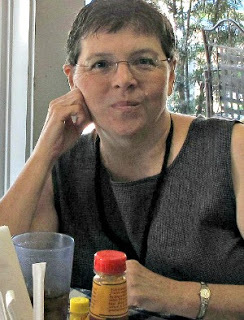 You are an inspiration with your no fear approach to repainting and redoing! I liked what I call the soft aqua color. That's about the only shade of blue I do like. I grew up with a LOT of blue in the house and just don't care for blues/grays now. I'm a green girl all the way!!! But, it's your home and your furniture – if you want it all purple, go for it!! I much prefer the blue! The mint green just didn't fit! Hi. I loved the mint green color, but I could live with the blue color the best. In a small area, mint green might seem a bit too zippy and bold. And that restful blue shade looks similar to a color I used in a bedroom once and I just loved it. That blue looks great with your dishes. Love the blue, the green really wasn't my favorite. The blue is just right…good choice! I like the blue you just now painted it. Never have liked the mint. Don't know why. Love how you show us to decorate, paint, and use potted plants to cheer up our lives. I like them both, for sure – either way your home always looks wonderful. I can see how the aqua would have bugged you next to the olive curtains, though. The blue is a better color in that regard. If you still had the red curtains up, either would have been fine! Brenda – would you mind sharing the brand of paint you used and the name of the shade? It's very nice. Thanks! I like the Blue. Mint to Me is kind of a "Non-Color"…not quite blue, not quite green. Silly, perhaps, but I like your No-Fear Style of Changing Things Up. Good for You! yea and two thumbs up for the blue. Great job Brenda. I am a big fan of both mint and blue. I do love the blue though, it looks great with the dishes. I like the blue better, but the mint green looked good, too! I have 4 different color samples on my wall at the moment. None of which I liked once they were up. Now you have this pretty blue, and I am thinking I may need just one more color sample… The blue is great! Love the blue…goodbye mint, love your cheerful decorating! The blue is much better. Love that shade. It's still too hot to decorate here, I'm desperately looking for pumpkins. Ok, having to wait to use your newly painted furniture is torture! It all looks great. I love the color and you sure got your money's worth out of that can of paint. I admire that! As you know, I like mint green as a colour, but it didn't feel right in your room, surrounded by the olive green. The blue looks much better! I like both the mint and the new blue. I have the same Corelle dishes and similar red & white polka dot bowls. 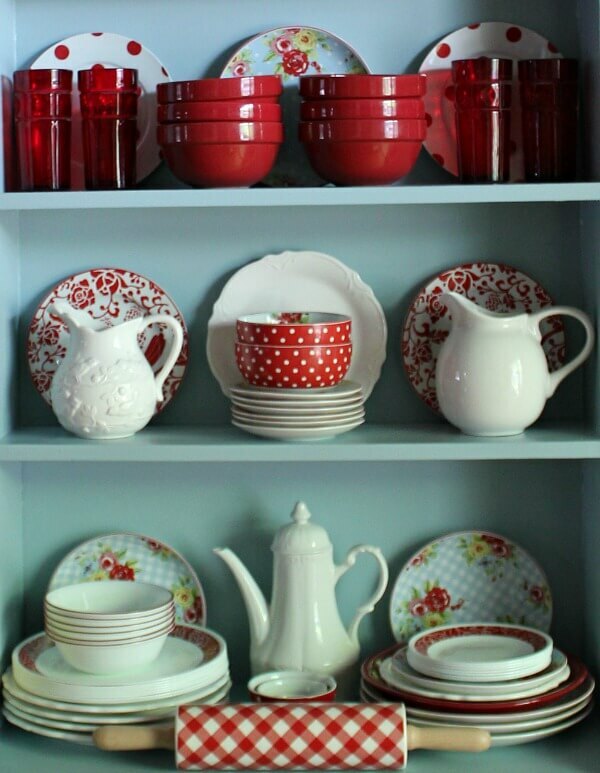 Love red & white kitchen ware! I love the blue…looks good with all the red…[BUt, I liked the aqua too.ha] Proud your happy with it.. Love the new look of the coffee table too.. The polka dot dishes are so pretty on the shelves..